Do you have a child that touches EVERYTHING? That is always on the move? That tends to fidget while sitting down? Enjoys hands-on activities and play-acting? If you answered yes! You may have a hands-on learner, sweet mama! Welcome to the club! Homeschooling your hands-on learner also known as a kinesthetic learner can be difficult at first, but it gets better when we change our mindset on how we think “school” should look like in our “home” school. We need to be flexible and patient when teaching a hands-on child. Why? They aren’t like the auditory and visual learners that can sit still and work out of a workbook for a long time. No! These precious children of ours need to be moving around because that’s how they process information and how they learn. They need to touch things and experience learning with both their mind and body. They learn by doing, by experimenting, by solving real-life problems and having a hands-on approach when learning a new skill. Being able to homeschool our hands-on child is such a blessing because we can give them a safe place where they can be themselves and thrive. We have the freedom to teach to our child’s gifting and customize each of our children’s education by meeting each of their needs. So let’s give these amazing leaners the opportunity to bloom in our home. All learners can benefit from a hands-on education. There are so many fun and engaging ways that you can incorporate hands-on learning in your homeschool. Hands-on learning is definitely not just for kinesthetic learners but for all learners. By providing a hands-on learning education in your home it can benefit all your children no matter their learning style. Hands-on learning makes any lesson come to life! When planning your hands-on activities don’t forget to include a way to incoporate your 5 senses. By incorporating our 5 senses (sight, hear, touch, taste, and smell) into a lesson you will find that it will enhance the lesson and help your child retain what they learn. By having kinesthetic learners in my home it has challenged me to find creative ways to effectively homeschool them. It also has helped me enjoy my son’s learning style and learned how to appreciate the way a hands-on child learns. It actually has been very insightful being able to see through the eyes of a hands-on learner. Here are 3 practical tips on how to homeschool your hands-on child. Your child learns and processes everything by keeping their body active. They just can’t sit still at a table for long periods of time and not move around. I know that it can be frustrating at times when dealing with a hands-on child so we need to provide them ways that they can stay active and finish their daily assignments. Here are some ways to help your kinesthetic learner stay on the move but get their lessons done. Instead of having your child sit on a chair get them one of those big bouncy balls or an exercise ball to bounce on. It will help them stay active as they work on their assignments. Don’t start your lessons right away without letting them play outside for at least a few minutes. It will help them burn off some energy, which will help them, later on, concentrate on their lessons. When doing read aloud make sure to provide your child with something to keep their hands busy. It can be easy things like having them draw in their notebook, playing with play-dough, squeezing a stress ball, or building with LEGO bricks. Instead of having them complete a math handout, for example, you can have them answer the question by clapping the answer, doing jumping jacks or jumping on a trampoline while giving you the answers to the problems. Get creative! If they are narrating a passage for you, repeating Math facts or whatever else let them pace. By keeping their body moving they will be able to process and recall what they learned. It is so important and helpful if we keep our lessons short if possible when doing any type of book work with our hands-on child, especially when they are young. I know as they get older their lessons will be more intense in that case you would want to let them take breaks so they can refocus and be refreshed for the next round of studies. By providing them with short lessons and short breaks (10-15 mins.) you will help your child thrive. During those short breaks let them…. You can sit down with your child and write a list of things he/she can do during their break time. Getting them involved in their education will help them learn to take ownership of their studies. A great way to homeschool a hands-on learner is to make their lessons hands-on. There are so many ways to do this. Use manipulative with their lessons. Play educational board games, card games, dice games…the sky’s the limit when it comes to games. Do Unit studies based on their interests. Child-led learning is great for hands-on learners. Homeschooling a hands-on learner requires you to think outside the box. It stretches your creativity and challenges you to find effective ways to homeschool your child. To be able to see your child blossom right in front of your eyes and have their confidence intact will make all your hard work totally worth it. 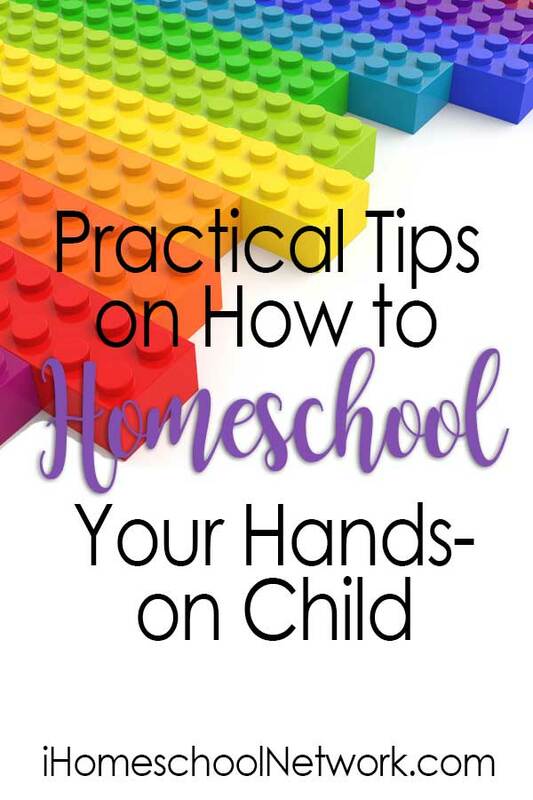 Please share one tip on how you homeschool your hands-on child.